Quick note: Tonight we’ll be in Minneapolis at the West Elm on 3879 Gallagher Drive for cookies, cocoa, and a book signing at 6pm (we hear this parking lot is small, but there’s a larger lot at a nearby Macy’s as well as a ramp that leads to a parking garage which should hopefully help – as will getting there early, carpooling, or getting dropped off). More info here. We’d love to see ya there! Were you ready? I told you it was crazy! But thankfully now that the secret book projects are out of the bag, we can share the insanity with you (since it’s no longer a spoiler for you to see our partially stenciled wall, the gray trim around that window, the green planter, that wooden headboard, the yellow branch wreath, or anything else that you might recognize from zee book). Here’s a vertical shot. Just as crazy, right? So when my mom came out for a visit a little while ago, we decided to tackle it together (me + mom = organizing nerdfest). Literally the second I put Clara down for her nap it was as if someone fired some imaginary gun at the starting line and we shot off in different directions to get that room cleaned up. Completely comical. Most of what you see in this picture are things that were going back into the room (the luggage goes in that closet, those shelves are for a future project, etc). And there’s my mom going through all the gift bags that I save to reuse (she was almost entirely on closet-duty, so she got to play with things like tissue paper, gift bags, and ribbon while I sorted things for yard sale and auction piles. About an hour and a half later, we could see most of the room again! It was weird. Like those dreams that you have of discovering an extra room. 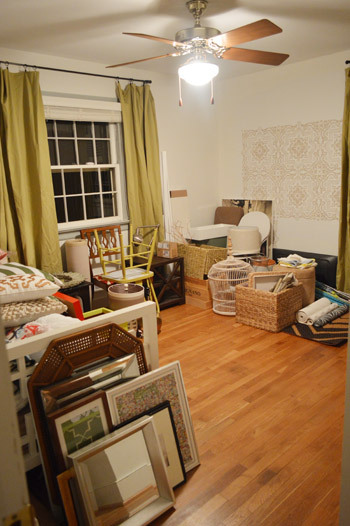 Tip: don’t fill a room with junk and you won’t feel like you’re discovering said room after hours of cleaning it out. 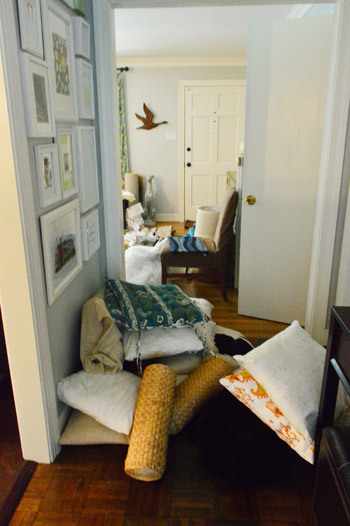 Sure enough, as the cluttered playroom got emptier, the areas in the entryway (and the adjoined hallway) got crazier. This was our yard sale pillow pile. Yikes. Note: You can read more about how the yard sale went here. I also brought a few things into the office since I wanted to use those items for Clara’s big girl room. See where I’m going? It all started with those green, purple & pink abstractly shaped pillow covers from Ikea in the bottom right corner of the rug. We also had a few smaller book projects that we felt especially attached to, so while we gifted/auctioned about 99% of the items that we DIYed for the book, we did keep a few little favorites (like the paint chip art on the right, the fabric covered lamp shade that we can’t wait to pair with this moose lamp, and the monument wood painting that John did with a paint color that Clara picked herself). So consider this a lazy gal’s mood board (toss everything on the rug and snap a picture, haha) for the colors and fun/random vibe I’m thinking will make Clara grin like she does when she covers her body with stickers. 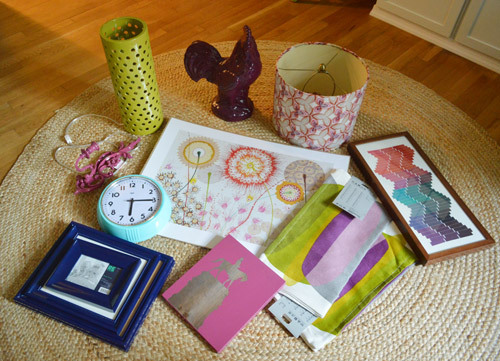 For anyone wondering where these items are from: blue frames (spray paint DIY project), blue clock & green dot light & chicken we sprayed plum (HomeGoods), flower print and pink/purple/green pillow covers (Ikea), fabric shade & paint chip art & pink painted monument wood art & pink candle sconce (favorite book projects). 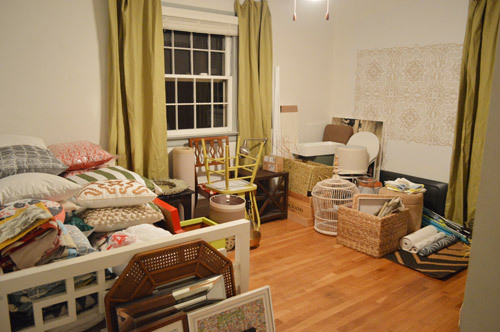 Here’s what the room looked like after we loaded things back in (the items under the window were smaller auction items that we didn’t want to leave out in the sunroom with the bigger ones, so they’re actually gone now). But the rest of everything is still in there since we put the yard sale stuff into the sunroom to keep it separated. Oh and you’ll notice that we tossed up the old curtains from our bedroom just to keep them hung so they’re not wadded up in some closet (but clearly they still need to be ironed/retrained so they don’t look all ganked up). Still looks pretty darn cluttered, but it’s not nearly as bad as it looked a few hours earlier. Whew. Thanks momma! Here’s the view looking back at the daybed (Clara’s future big-girl bed) covered with pillows (yes, I have a pillow problem, but in my defense we still have a daybed in the sunroom and Clara’s big girl room to use them for). Then maybe we’ll need to have another yard sale… haha. See that big rectangle of blue paint? Just another wall we painted for book shooting. That wall actually got painted three times (navy for a headboard project, paprica red for cloud shelves we made, and then blue for a tip about not painting all the way up to the ceiling). It’s crazy to think about how many things we painted and repainted back in January! Oh and see that green chair and twig mirror in the bottom corner of this pic? Those are book auction items, so they’re cleared out and no longer on the floor. Speaking of the auction, we made $500 for charity thanks to generous locals who bid on our secret book stuff in the silent auction last week at the R. Home for the Holidays event. Woot! We’re so thankful to you guys for giving those items a good home. And we wish we could have opened up the bidding up to a wider span (nationally or even internationally) but shipping things (many of which were large and heavy) made it too complicated for a two person “company” like us (it also would have diminished a lot of the profit we were trying to make for the charity). But to any locals who went home with something, we’d love to see pics of things in your rooms! And to anyone else anywhere in the globe, if you DIY anything from the book (since you’ve definitely got the info on what we used/how we did it) of course we’d love to see those pics! As for the closet, here’s my mom’s handiwork. She’s awesome, eh? I think sorting all of my gift bags and ribbon might have been the highlight of her trip. Well, that and seeing sweet Clara of course. Ok, Clara wins. Oh and see that weird line of paint to the left of the closet in the pic above? Yet another wall that we painted at least three times for book backdrops. We so crazy. 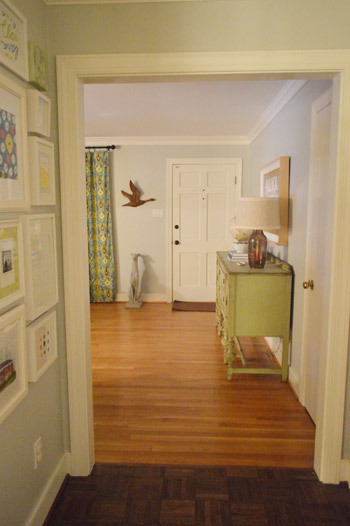 Ahhh, but behold: nothing’s in the entryway or the hallway anymore. Can I get a what what? Please tell me you guys at least have a closet or a junk drawer that’s looking pretty hairy, just so I don’t feel so alone. Haha. And you know what partially clearing out this room means… we’re one step closer to converting it into Clara’s big girl room (although we still have the hall bathroom and the basement to finish along with an untouched sunroom, carport, and guest bathroom). You know we’re all over the place, so it’s only a matter of time before we bounce in there too. Bring on the paint, the fabric, and the moose lamp! Update: Nope, I’m not prego! Maybe I need to add an update to this post? Yup, I’m doing it. I, Sherry, hereby solemnly swear that I’m not with child. Haha. Spread the word! Ours isn’t a room so much as my closet. It’s where everything goes to get dealt with “another day.” Right now I have to wear a hard hat to open the door. Oh yeah and I would so make a road trip to attend your yard sale!! 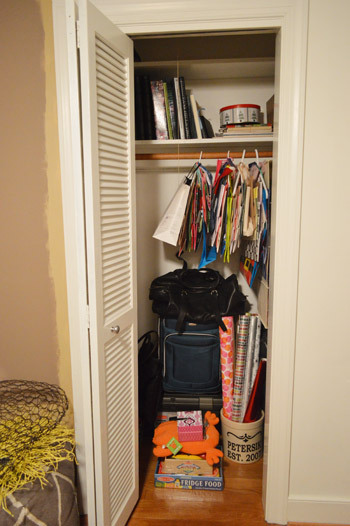 We have one of these too… a good size closet where “everything else” goes. 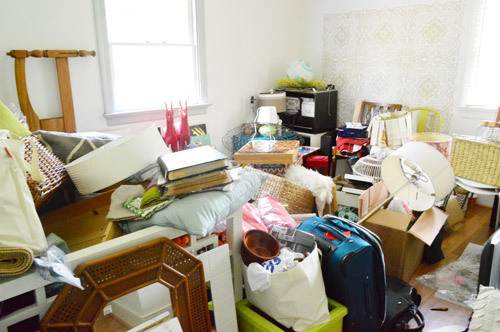 We started in on it this weekend… before you couldn’t walk into it… it was that bad… We have removed about 75% of the stuff and out of that, over %50 has been designated for craigslist sales or bulk pick-up which starts in less than two weeks here. I can’t wait for it all to be gone! I can only imagine the amount of work that went into that – you can spend all day on a room on only get a fraction of what you wanted completed. Great job!! Crystal from 29 Rue House and I actually started a competition to try and motivate eachother to organize our rooms. Who knows – we may even issue a Crazy Clean Challenge (similar to Pintrest Challenge) to anyone who wants to partake. We can do posts on ‘before’ and ‘after’ as well as, share our tips on how we organized, link to each other’s blog, etc. That sounds like fun! Good luck!! Sign me up for that challenge! My basement is the only junk room, and it’s especially awful right now. Finding an extra room in our apartment would be awesome!! Can’t wait to see what you do for Clara’s big girl room. What an improvement! I tried to get my husband to let me big on that white desk at the silent auction or one of the chairs – but honestly we have zero room in our house for more furniture. Glad someone else got it thought! The room looks SO much better, but truth be told, it still makes me anxious! I just don’t like to have things around that don’t have a place. My folks house has a room like that (and closets and drawers too) and it makes my skin crawl. Then again the rest of your house is pretty spotless! And disclaimer – my condo is only 434 sq ft.
Before we made my studio into…my studio it would get crazy over and over again! Because it was nothing but a storage room. Now I wonder where all that crazy went now. We are doing Greta’s Big-Girl room for Christmas. And it is so so so exciting. I could design and decorate little girl’s rooms all day long. I have a storage room in our basement bursting with projects and things I want to sell when I set up an online shop. So, don’t worry, you are not alone! We have a clutter room, too! It’s like clutter purgatory: it’s not going to the attic yet, but it’s also not going to the curb. It’s just stuck where it is. Love the vibe of Clara’s big girl room! PS. I just sent you a quick little note on some must-see/must-eat things in Dallas! Hope your travels are all awesomesauce! I have two cabinets in the kitchen that are driving me crazy! My kids and husband never seem to put things back in same spot that they got it from, drives me bonkers! haha I will get around to it one day. You have to know you are not alone! We have a guest room that looks like a garage/storage room. My hubby is a huge car guy with no garage so he started sticking stuff in there. Then I got into blogging and projects and then I started sticking stuff in there for projects in process. A few months later and it is a “YIKES!” moment every time you open the door. So closed it stays until one day…way to go on reaching your one day! You are far from alone! My den and craft room definitely rival that playroom. The den is brimming with stuff that needs to be sold on CL along with some barstools that need to be recovered and sold. If a cat gets in there, we just declare it lost for a couple hours. My craft room plays double duty for my creative needs and also beer which my husband and I brew. So in between sewing or scrabble tile projects are carboys or 22’s mixed in everywhere. Thankfully, with the holiday break coming up, I can get to work on making everything not quite so crazy. Nice work for just one afternoon! Truthfully in those first pictures I didn’t even know you had a bed in there! ha! Our entire basement looks like this though – so having just one room isn’t bad at all (at least in my making-excuses-for-our-cluttered-basement mind)! “Like those dreams that you have of discovering an extra room.” Hahaha, I didn’t know anyone else had those! I always feel a little disappointed to wake up and realize it’s not true. I so need to do this with my “nursery” too. It turned into the room where things got thrown when we moved just to get them out of the way. …now it’s the room of doom. Can’t wait to see it as the “big girl room”! I have a “big boy room” to plan and I am hoping to see some ideas that can “go both ways” so to speak. Great job! Thanks to Sandy, the hubs and I had to seriously clean out/reorganize our spare room (move things off the floor, move everything away from windows, etc. )… and somehow it has stayed clean! It’s like a miracle so I know exactly how great you feel to no longer have a messy room! Awesome transformation! It’s amazing how much stuff you can pile into a room you’re not using! I love organizing, but have an issue with getting rid of the piles.. For instance, my garage sale pile has been sitting in a corner of the basement for over a year and the clothing we’re donating to Goodwill has been sitting in another corner for nearly six months! I need to put that at the top of my own ‘Dude, get on that already!’ project list! Haha that happens to us too! Good luck Lindsay! The moose lamp is going to be adorable!! I keep picturing that stenciling on the ceiling of a small room, to make it look like a tin ceiling. Obviously not really look like one, but more of a modern, playful, ode to one. Oh, and yes, we have one of those rooms. It’s the office. Also, we have ALL of our furniture in the original house during renovations. Crazytown usa. I love the idea of that stencil on a ceiling!! Ooh, do it and send us pics. So excited for the event tonight! Are the gift bags hanging on regular hangers? I hadn’t thought of that. Your mama’s a clever organizer! Oh yes, she’s the best! Unfortunately, this is what our basement looks like (with a few less pillows). So do you think the “playroom” is ever going to actually be used as a playroom? I don’t blame you for having an unfinished room in your house (I have plenty, and your lives are much busier than mine), but I would love to see what you would do with such a fun space! Looking great! Thanks for sharing. Wish I had been able to be at that auction – sounds fun! I love cleaning a room like this – there is something therapeutic about it. But, on the other hand, during the process (which I’m sure we would have done the same thing) I’d be going crazy. You look in the playroom and it’s like you can breathe again. Good job. Congrats on a successful auction! What charity(ies) are you donating to? It must be such a relief to have all that cleared out. Oh yes, it feels great to have it all cleared out! Each year we donate $1000 to the Habitat for Humanity as well as $500 to St Jude’s and $500 to the Richmond SPCA, and this specific auction through R Home was actually for the Richmond Ballet Foundation (which helps young children participate who otherwise wouldn’t have the means to). They do amazing productions and the kids from the company were dressed up at the event! So adorable. 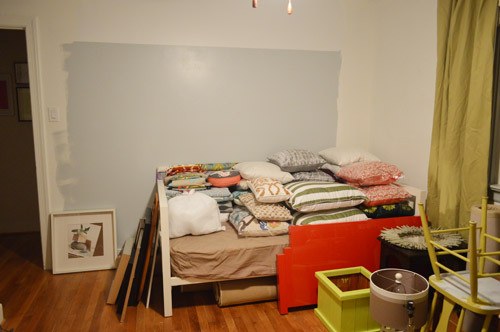 I love starting with a blank pallet for a room…I can’t wait to see what comes of this space! You guys are an inspiration. The amount of painting and repainting that you did in the playroom makes me think that I can just paint my G-D kitchen ceiling already I(maybe tonight?) so I can stop panicking that people will come over and see my raw drywall repairs. I know right?! I was thinking that room looked like the estate sale of my dreams. I love love love the idea of hanging the gift bags- that is GENIUS!!! Thanks, Sherry’s mom, for that lightbulb moment! I think everyone should have a room that they can store ideas in, where they can play around with creativity. I love that stencil on the wall! My husband and I were married on New Year’s Eve and then lived in purgatory (a.k.a. a tiny rented house) until we bought our current home in August; we’re both teachers and closed on the first day of school! 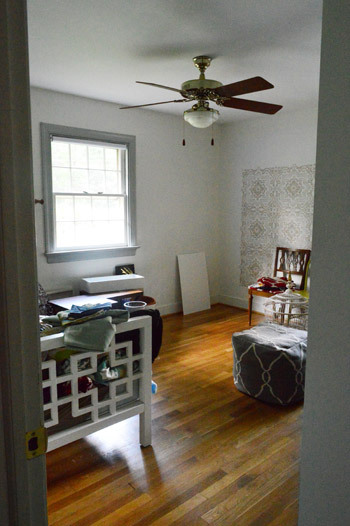 Then we spent all of our weekends taking down all the 1985 colonial-style wallpaper, re-painting all wood trim (it was all burgundy, navy, or dark green, EEEEK), and painting. After we got our stuff in the house, we took a collective sigh and just kind of stopped! 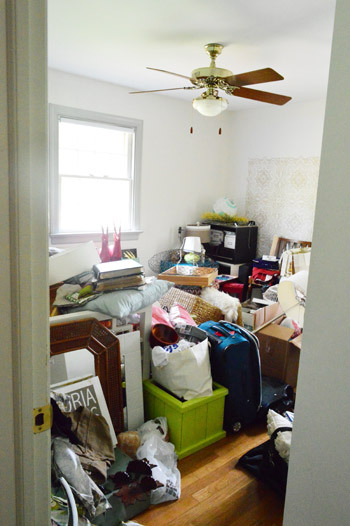 A few rooms have seen new furniture and organization, but we have several shameful rooms. BUT, yesterday was my birthday and one of my gifts was a CERTAIN BOOK (!!! ), so I’m thinking that I just found my inspiration to get cleaning and DIY-ing! I seriously considered taking off school today to sit at home and read it. Wahoo! So excited to meet you Kate! *throw. Gah, I’m a mess! Haha. Our basement is a disaster, my brother is temporaryly living with us and there is a ton of extras down there. Let me put it this way, last time I went down there my husband asked if I wanted some crumbs ala Hansel and Gretel. Our spare room totally becomes the catch all and can drive me crazy sometimes! I’m sure you can now breathe when you walk past it :). We have our sons big boy bed in waiting in our spare room as well although I’m starting to think he might not need it until he is 3 (he just turned 2). I’m sure your room will be transformed into something beautiful like you guys always do! Aw man, I think she needs a “Dude get on that” challenge! Haha. “You are not alone….” Sorry, I channeled a little MJ there. We have an entire room that looks just like this. It’s a dining room, so the table is there, which means stuff is crammed underneath AND on top AND all around the whole room – things for projects & things to sell & piles of fabric for me to make curtains & recover the chairs that are ‘supposed’ to go around that table & I’m sure more than I can even remember stuffing in there. There used to be a path, but alas, the path no longer exists. We have made it a goal to take back control over this room by the end of the year & maybe actually be able to put chairs around the table & eat in there. Wish us luck! Now everyone’s going to be on bump watch now that you’re talking about moving Clara into a big girl room! 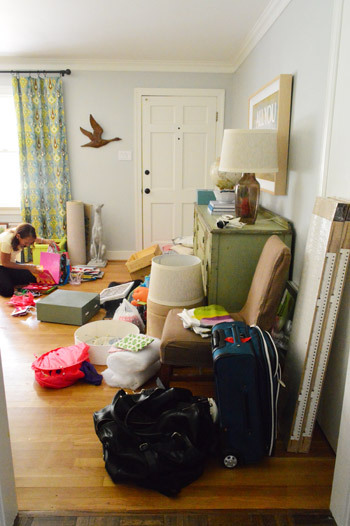 And omg it feels so nice to see a normally perfectly tidy seeming house have clutter and crap everywhere. Although it seems like ya’ll never have dog/people hair tumbleweeds everywhere like I get in my house constantlyyyy. Though we’ll all be happy for you when it does happen, it makes me laugh and I am totally amused by how many people are interested in the state of your uterus. Would you mind please updating us on the status of your kidneys and liver while you’re at it? (P.S. I do not mean that in a snarky tone what so ever. Not even close. I’m completely laughing when I say it. I think it’s adorable people care so much since what you put out there about Clara is so cute). I need to stop reading Fifty Shades of Grey but I died laughing when I saw this title… Your playroom is definitively PG. This made me literally laugh out loud! Great job Sherry! Oh and where did you get that daybed from? I am currently on the hunt for one for my son. That was from West Elm a while back. It was actually a wedding present from John’s god mother and we got the mattress ourselves to save money (any twin mattress fits). I was just thinking about the status of your playroom the other day- what timing! You and your mom did an awesome job; I can’t wait to see how Clara’s big girl room turns out! Oh, and don’t worry, our basement and garage both look like a bomb went off, so you’re not alone! P.S: Loved meeting you on Monday night, and I hope this crazy book tour week is amazing for you two, but that it passes quickly so you can go home to Clara and Burger! I know it must be hard to be away from them- you two are awesome! We had so much fun meeting you too Nicole! Thanks so much for coming out!